Suncatchers may make you think of tissue paper crafts you made as a child to hang in the window, but they can actually be made into a more glamorous and adult version that can bring some pretty rays into your living space. This suncatcher uses gorgeous faux roses to create a pretty and romantic piece of decor. For an easy way to bring the sunshine indoors, check out this Mother Nature-inspired sun catcher. In just a few easy steps, this pretty DIY project can be hanging in any window of your home. 1. Lay out contact paper, sticky side up. Place the embroidery hoop on top of the paper and trace around it with a pencil, leaving about half an inch of extra contact paper on the outside edge. 2. Cut off all the petals and leaves from the faux roses. 3. Peel off the backing from the contact paper. Place the embroidery hoop onto the contact paper. 4. 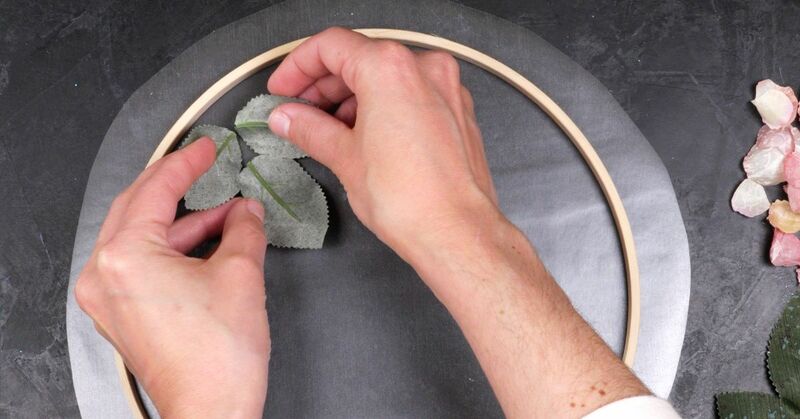 Place the leaves and rose petals onto the contact paper, inside the hoop. Once all the faux leaves and petals have been placed, remove the hoop from the contact paper. 5. Peel off the backing of an additional sheet of contact paper. Place this piece sticky side down on top of the sheet covered with the petals and leaves. 6. Use the back edge of the scissors to flatten the contact paper to remove any bubbles. 7. Place the contact paper inside both pieces of the embroidery hoop, making sure it is taut. 8. Cut off all excess contact paper that hangs over the edge of the hoop.